26 cm tall (10.5 inches). 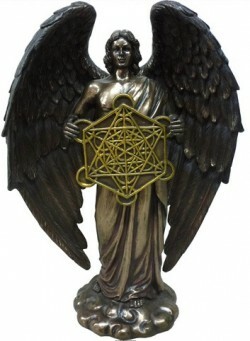 Archangel Metatron was the ascended great-grandfather of Noah, originally named Enoch. He holds a representation of Metatron's Cube; a geometric figure composed of 13 equal circles with lines from the center of each circle extending out to the centers of the other 12 circles. There are no references to Metatron as an angel in the Jewish Tanakh or Christian scriptures; however, Genesis 5:24 is often cited as evidence of Enoch's bodily ascension into heaven - "And Enoch walked with God: and he was not; for God took him. An eye-catching figurine for display in the home. Includes a collector's tag with extra info.